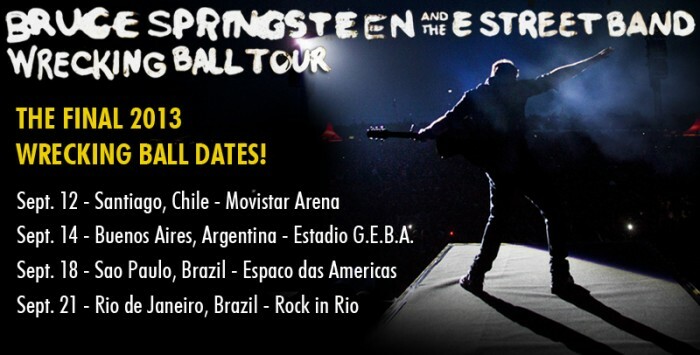 Bruce and the E Street Band have added new South American shows to their 2012-2013 'Wrecking Ball' World tour including a recently announced show in Buenos Aires on September 14. The shows precede the previously announced, final 'Wrecking Ball' performance at Rock in Rio concert in Rio de Janeiro on Sept. 21 and are the final additions to the tour. The 'Wrecking Ball' World Tour has reached fans in more countries than any Springsteen tour and by its end will have included 133 shows in 26 countries for a total of 3.5 million tickets. Commencing in March 2012 at the Apollo Theater in New York, the tour crossed North America, South America, Europe, and Australia with shows being described as "the stuff of legend" (Irish Independent) and "some of Springsteen's best shows ever" (Rolling Stone).